I loved the idea of using quinoa, an indigenous Incan supergrain loaded with protein, but it reminded me of a sad cousin to couscous. Sometimes it tasted bitter, and it often seemed light and boring in comparison to rice. I experimented successfully with new recipes and now I eat quinoa at least weekly. Different brands of quinoa are cleaned in different ways, so don’t give up on quinoa. I promise you it will become one of your favorite grains. If your brand of quinoa is bitter, soak it for 4 to 6 hours, which removes some of the characteristic bitterness, improves the texture, and makes the quinoa more digestible. Preheat the oven to 400 degrees. Scrub the beets and dry them. Put in a medium bowl and drizzle with olive oil. Wrap the beets in 2 separate aluminum-foil packages, putting like-sized beets with like-sized beets. Roast until tender, about 45 minutes. When the beets are cool enough to handle, slip off the skins with your fingers. Cut the beets into ¼-inch-thick wedges. Put in a large salad bowl. Rinse the quinoa under cold running water. Bring a medium saucepan of generously salted water to a boil. Add the quinoa, reduce the heat to low, and simmer until the quinoa is fluffy but still slightly crunchy, 15 to 20 minutes. Drain and rinse quickly under cool running water. Drain well and add to the beets. Add the beans and onion to the salad bowl. Cut the avocado in half lengthwise and remove the pit, leaving each half in the skin. Cut each half lengthwise into ¼-inch-thick slices. Then cut the slices crosswise into thirds. Using a spoon, scoop the avocado from the skin and add to the bowl. Toss gently. In a small bowl, whisk together the lemon juice, vinegar, and honey. Drizzle in the olive oil in a thin, steady stream, whisking continuously until the dressing comes together. Season to taste with salt and pepper. Pour the dressing over the salad, toss, adjust the seasonings, and serve at room temperature within 2 hours. 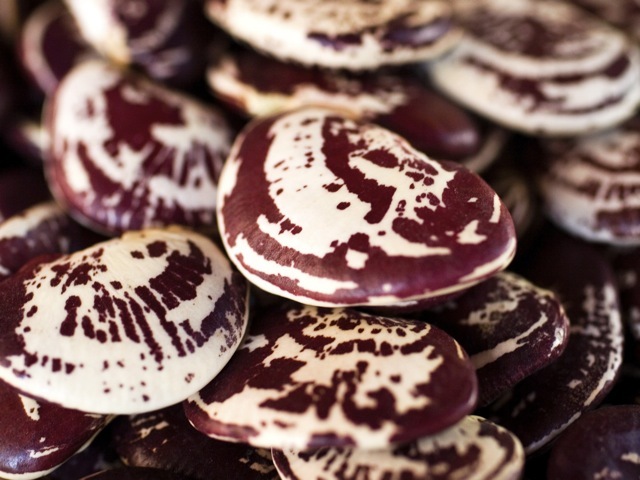 Any big, meaty bean will work well in this dish; try scarlet runner beans.